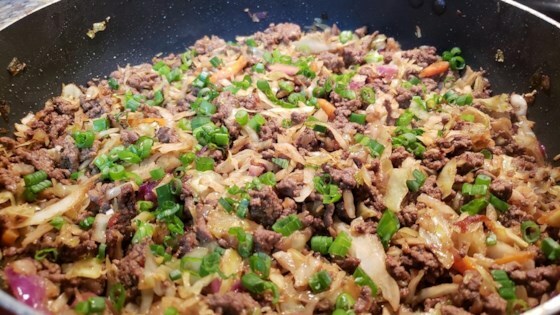 "This keto slaw uses beef but you can substitute pork instead." Heat oil in a large skillet over medium-high heat. Add diced onion, white parts of the green onions, and garlic. Saute until onions are translucent and garlic is fragrant, about 5 minutes. Add ground beef, sriracha, ginger, salt, and black pepper. Saute until beef is browned and crumbly, about 5 minutes. Stir coleslaw mix, soy sauce, and cider vinegar into the beef mixture. Saute until coleslaw is tender, about 4 minutes more. Top with the rest of the green onions. Feel free to substitute olive oil for the sesame oil. This was really good. Due to adding the soy sauce at the end, I would recommend not salting prior. Add some crunchy chow mein noodles and delicious!!! I found that it didn't have enough coleslaw mix. I would increase it to 18 ounces. Super easy and delicious! Full of flavor. I used fresh ginger (since I had it) and added a little extra Sriracha to the top of my bowl. So good! Love it! I also added broccoli with the cole slaw mix.